In this paper, electrical and structural properties of mono-, di-, tri- and tetrachlorothiophenes and their radical cations have been studied using the density functional theory and B3LYP method with 6-311++G** basis set. The effects of the number and position of the substituent of chlorine atoms on the properties of the thiophene ring for all chlorothiophenes and their radical cations have been studied. Vibrational frequencies, nuclear chemical shielding constants, spin-density distribution, size and direction of dipole moment vector, ionization potential, electric polarizabilities and NICS values of these compounds have been calculated as well. The analysis of these data showed that double bonds in 3-chlorothiophene are more delocalized and it is the best possible candidate monomer among all chlorothiophenes for the synthesis of corresponding conducting polymers with modified characteristics. Electrically-conducting polymers such as advanced materials and the new class of 'synthetic metals' have drawn high attention in the last years . The 2000 Nobel Prize in chemistry recognized the discovery of conducting polymers and over 25 years of progress in this field [2, 3]. There has been growing interest in research on conducting polymer nano structures (nano-rods, -tubes, -wires and -fibers) since they incorporate the advantages of organic conductors with low-dimensional systems and so create interesting physicochemical properties and potentially useful applications [4–7]. The varieties of such studies have been reported in the literature that includes: surfactants [8–11], liquid crystals , polyelectrolytes , nano-wire seeds , thiophene oligomers , bulky organic dopants [16–21]. Among intrinsic conducting polymers with conjugated double bonds, polythiophenes (PTHs) and related derivatives are suitable for commercial applications . Polythiophenes are normally produced from non aqueous media because the monomer is more soluble in them. The influence of water on polymerization process of thiophene as well as on the redox switching properties has been studied [23, 24]. It has been recently shown that the attachment of a range of electron-donating or electron-withdrawing groups through a conjugated linker has a dramatic effect on polymerization potential and subsequent photovoltaic performance [25, 26]. Polythiophene has a solubility of 75% (w/w) in chloroform and a conductivity of 220 s cm-1 . The effect of temperature on polymerization process of thiophene has been investigated as well . Results show that when polymerization is carried out at 15-20°C, polymers with optimal properties will be obtained. Ultrasonication has been used to improve the efficiency (improved yield, lowering of polymerization potentials) of electropolymerization process of polythiophene . Thiophene is oxidized to form a conducting electro active polymer (CEP), with the best conductivity when it is created from α-α' linkages . In polypyrroles, the mechanism of polymerization involves the formation of radical cations which react with another monomer to develop the polymeric structure (Figure 1) . Polymerization of Thiophene (where R = H or a substituent). The objective of the present research is to study electronic and structural properties of all chlorothiophenes (shown in Figure 2) and their radical cations using DFT-B3LYP and DFT-UB3LYP methods. All possible mono-, di-, tri- and tetrachlorothiophenes studied in this work. The electropolymerization and characteristics of monomers (conductivity and solubility) are related to the stability of their radical cations which it is closely dependent on the type and configuration of the substituent on the thiophene ring . Vibrational frequencies with analyses of their IR intensities and NMR shielding constants will be used to characterize and predict the molecular and spectroscopic properties of fluorothiophenes. First of all, structures of representative mono-, di-, tri- and tetrachlorothiophenes were optimized using B3LYP/6-311++G** method [30–32]. The geometries of these compounds were optimized using standard gradient techniques with default parameters set in G98W. Vibrational frequencies with their IR intensities are calculated with scale factors, f = 1.0100 for low-frequency vibrations (below 1000 cm-1) and f = 0.9679 for high-frequency vibrations (above 1000 cm-1) . The vibrational frequencies analysis showed that all structures correspond to local minima in potential energy surface. In this section, the electrical and structural properties of chlorothiophenes and their related radical cations have been studied. Because of the stabilizing effects of the delocalization of non-bonding p electrons of sulfur atom, it is expected that the thiophene molecules possess a plane structure. In agreement with this expectation, results of the present calculations show that all chlorothiophenes possess planar structures (the optimized values of all dihedral angles of all structures are either 0° or 180°). The optimized structural parameters obtained at B3LYP/6-311++G** level of theory for all chlorothiophenes and UB3LYP/6-311++G** level of theory for all radical cations are listed in Tables 1 and 2. To predict the bonding-characteristic behavior of chlorothiophene rings in their corresponding polymer chains and to determine the extent of the π-conjugation character of these polymers, we have used the F n coefficient defined in Equation 1 for each thiophene ring . As this table shows, 3-chlorothiophene has the smallest value of the F n coefficient. Therefore, it can be suggested that double bonds in 3-chlorothiophene are more delocalized. Electropolymerization process for each molecular radical cation is obtained from α-α' (C 2 -C 5 ) linkages , so it can be said that in a compound, the greater spin density in Positions C 3 and C 4 is, the higher electropolymerization rate will be . The spin-density distribution over the ring atoms of chlorothiophene radical cations have been calculated and presented in Table 3. As shown in this table, it is obvious that monomers B and F have the maximal spin density on positions C 3 and C 4 . This means that the electropolymerization of 3-chlorothiophene (B) and 3,4-dichlorothiophene (F) can be more favorable ratio with respect to other molecules. Orientations of the polymer chains in the condensed phase are the most important parameters affecting the electric charge transport properties of polymers so that the electrical conductivity of a polymer chain is altered when its orientation and consequently its symmetry and non isotropic interactions are changed. Chemically synthesized PTHs powders exhibit a partially crystalline structure in which the chains align and pack in a herringbone arrangement (Figure 3) in the crystalline regions . Illustration of stacking arrangements proposed for polythiophene; (a) herringbone stacking arrangement, (b) lamellar stacking arrangement. These overall interactions can be well expressed in terms of interactions between local dipole moments of monomers. The local alignment of monomers' dipole moments in solution with respect to the orientation of the polymer chain determines the electrochemical properties of the polymer formed on electrode surface. In addition, the orientation of monomer in the double layer of the solution in an electropolymerization cell depends on both size and direction of the dipole moment vectors of both monomers and polymer chain . It is necessary to study the dipole moments of these chlorothiophenes to be able to predict their electropolymerization properties. The size of the dipole moment vector and its components calculated for chlorothiophenes in this study are presented in Table 4. The size of the dipole moment vector for monomers C and F is greater than other compounds. Therefore, compounds C and F have a high solubility in polar solvents. These characteristics increase the efficiency of electrochemical polymerization processes of these monomers. Moreover it can be seen in Table 4 that thiophene has a low solubility in polar solvents. 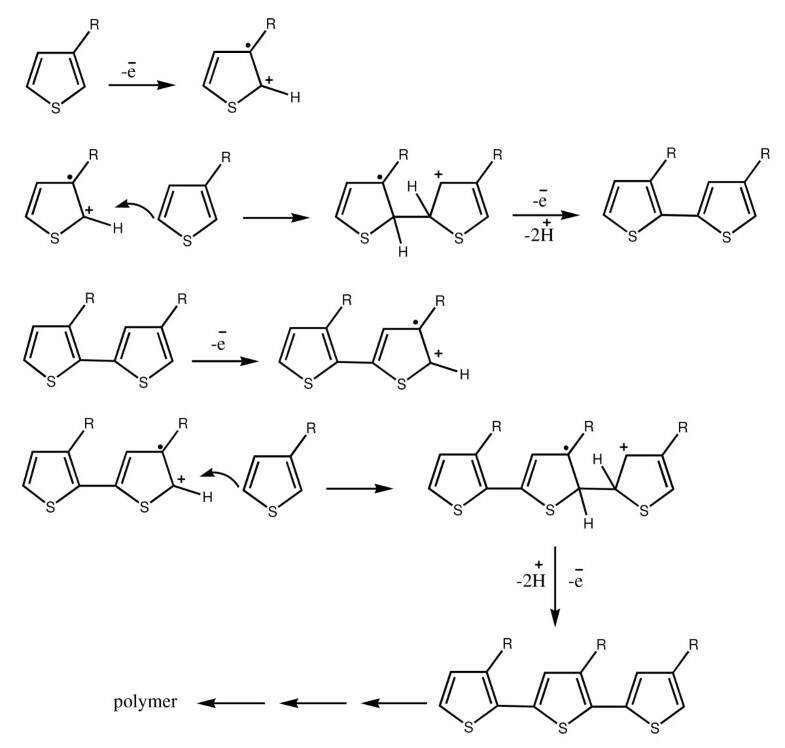 The first step in the electropolymerization of conducting polymers is formation of intermediate radical cations from monomers which can be considered as an ionization reaction . where M and M·+ denote monomer and its radical cation respectively. So, stability of intermediate radical cations has an important role in the electropolymerization process. Since ionization potential energies are directly proportional to the electrochemical oxidation potentials of the compounds, it can be said that the electrochemical stability of monomers F and B are greater than other compounds. Values of Polarizabilities of compounds containing halogen are used to interpret light scattering and intensities of vibrational Raman spectra . Values of exact electrical polarizabilities for all chlorothiophenes have been calculated and listed in Table 4. Based on this table, it can be claimed that with an increase in the number of chlorine atoms on the thiophene ring, polarization values will increase as well. The zero values obtained for polarizabilities α xz , and α yz are consequences of the planar structure. The small values of α xy polarizabilities indicate that the delocalization strength of the π-system of the ring dominates the anisotropic effects of substituent for asymmetric chlorothiophenes. Thiophene and 3-chlorothiophene have the highest low-frequency values among all these compounds; this means that thiophene and 3-chlorothiophene have the largest force constants for their bending modes of vibration. Higher values of low frequencies obtained for thiophene and 3-chlorothiophene can be regarded as higher protection from thermal decomposition for these molecules. The calculated Zero-Point vibrational Energy (ZPE) for thiophene and all chlorothiophenes are listed in Table 6. Having in mind the contents of the table it can be said that ZPE for thiophene is greater than other compounds, as a result the relative thermal stability of thiophene is higher than other compounds. The NMR chemical shifts can be used to predict ring current and estimate aromaticity of all chlorothiophenes [38–40]. 13C chemical shielding have been calculated for DFT-B3LYP/6-311++G** optimized geometries of all chlorothiophenes. The isotropic and anisotropic magnetic shielding have been calculated using GIAO and CSGT methods [41–43]. 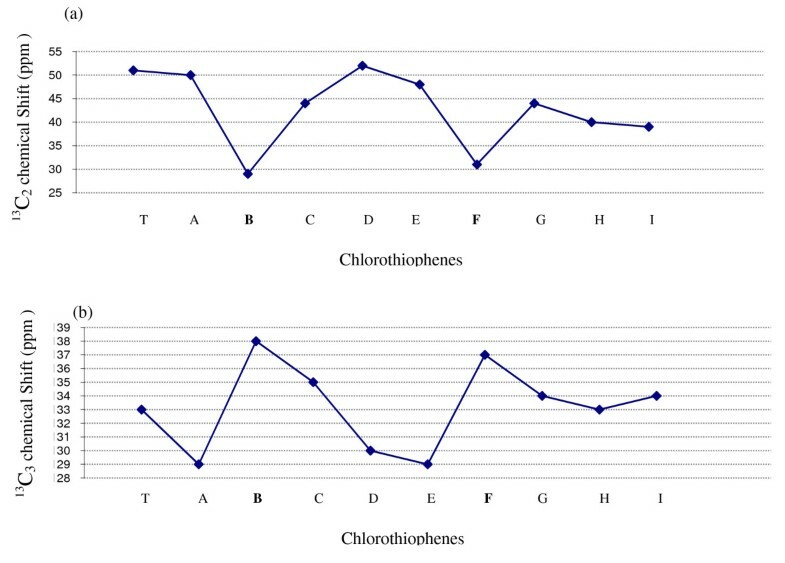 Values of chemical shifts in Positions C2 and C3 for all chlorothiophenes are calculated and presented in Figure 4. It can be seen from this figure that compounds B and F have the lowest chemical shifts in Position C2, these molecules have the highest chemical shifts in Position C3, as well. It should be noted that these compounds had the highest values of spin-density in their Position C3. GIAO calculated values of the chemical shifts for Thiophene and chlorothiophenes (referenced to TMS); (a) 13 C 2 chemical shifts, (b) 13 C 3 chemical shifts. The Nuclear Independent Chemical Shift (NICS) at GIAO/B3LYP/6-311++G** and magnetic susceptibilities at CSGT/B3LYP/6-311++G** level of theory [44–49] in center, 0.5 and 1 angstrom upper than thiophene ring have been calculated and listed in Table 7. Negative values of NICS represent the magnetic shielding and electric current in cyclic compounds. NICS results showed that compounds B and F have the highest NICS values in rings center, 0.5 and 1 angstrom upper than thiophene ring; these compounds have the largest electrical current and most conductivity among all other compounds. Based on this table, it can be claimed that the magnetic susceptibilities of these molecules increase with the number of the chlorine atoms, as well. B3LYP method with 6-311++G** basis set calculations have been carried out successfully to study the structural, electric and spectroscopic properties of all chlorothiophenes. Values of dipole moment, spin density distribution, ionization potential, vibrational frequencies and NICS have been calculated and analyzed. The analysis of the data showed that 3-chlorothiophene has the smallest values of the F n coefficient. Therefore, it can be suggested that double bonds in 3-chlorothiophene are more delocalized. Electrochemical stability of 3-chlorothiophene and 3,4-dichlorothiophene is greater than other chlorothiophenes. Thermal stability and Zero-Point Energy of thiophene are greater than all chlorothiophenes. The 3-chlorothiophene and 3, 4-dichlorothiophene possesses the largest NICS value; these compounds have the largest electrical current in the thiophene ring. Accordingly, compound B (3-chlorothiophene) is the best candidate monomer among all chlorothiophenes for the synthesis of corresponding conducting polymers with modified characteristics. The synthesis feasibility, experimental measurement and thermo chemical stability of these chlorothiophenes are interesting subjects for study. This research was supported by the Islamic Azad University, Toyserkan Branch, Toyserkan, Iran. SJ-B proposed and supervised the program, and participated in data analysis and draft reversion, coordinated the study and modified the text. HS participated in data collection and manuscript drafting, completed the molecular design, the arrangement of the work and modification of the manuscript. SJ-B and HS participated in the separation and purification of compounds, acquisition of data, and collection of literature and helped to draft the manuscript. Authors read and approved the final manuscript.